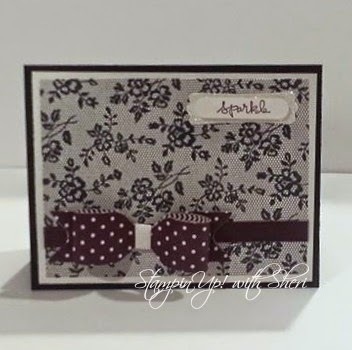 Black lace, ribbon, bling and a bow! 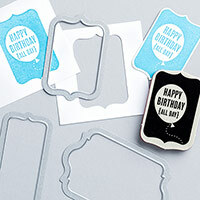 Love this background stamp! Do you have yours yet? Come attend my Open House on Monday - RSVP now! 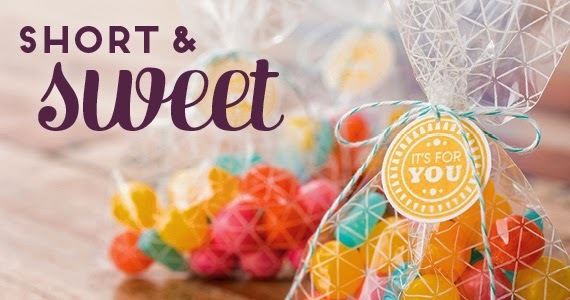 Or you can place an online order today and use my Open House Hostess Code of BVYXJNKK, and your name might be drawn to be the Mystery Hostess. 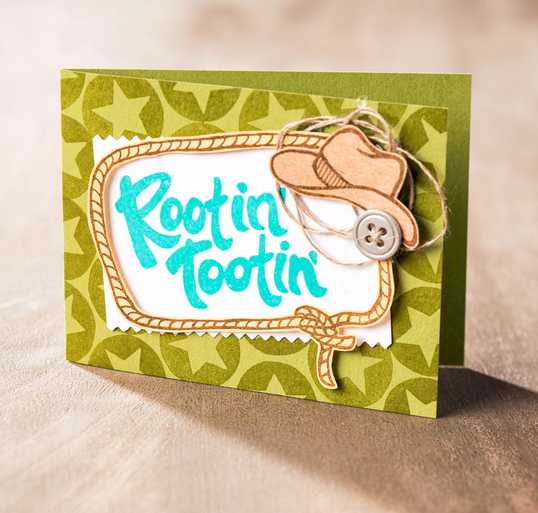 If your name is drawn, you will win the Hostess Rewards and if the party is over $325, you will receive the Good Greetings Hostess Set used to make this card too! Invite your friends over and wrap up your gifts and your holiday to-do list. 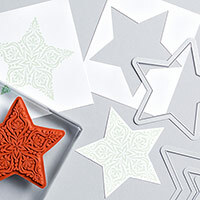 With all the materials to create cards, decor and packaging, we've got what you need to make the season merry and bright! Click here to see if the new catalogue, and contact me if you would like a your own copy to hold in your hands! 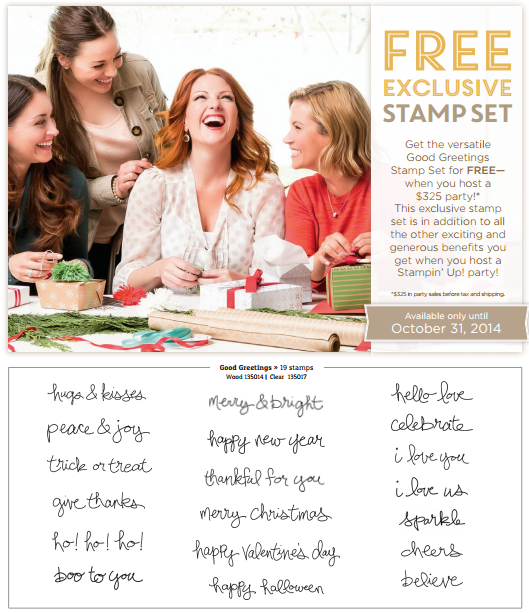 Free Good Greetings Stamp Set! 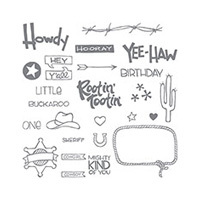 Now until Oct. 31st, you will be able to earn an exclusive Good Greetings Stamp Set when your party reaches of $325-that's in addition to the other exiting benefits! 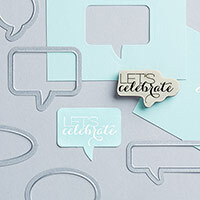 That's right, a FREE stamp set in addition to all the other exciting and generous benefits you get when you host a party from Aug. 28 to Oct. 31! 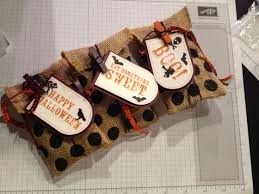 This versatile stamp set covers holidays from Halloween to Valentines and more. Book your party today! Tomorrow is the last day of this short & sweet deal to join my team for only $125 and receive $190 worth of product of your choice!! 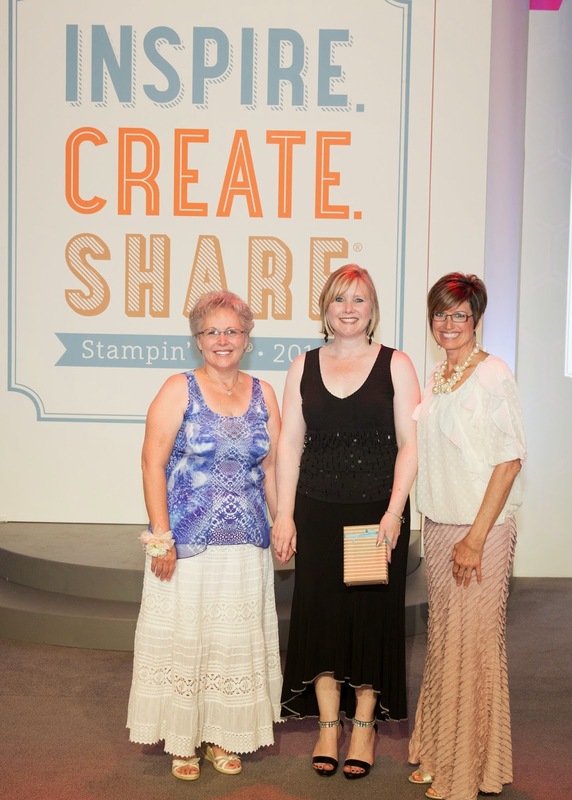 Thinking of joining Stampin' Up! Do I have a deal for you! For one week only--August 21-28--new demonstrators will receive $190 worth of products (instead of $155) in their Starter Kit for just $125! 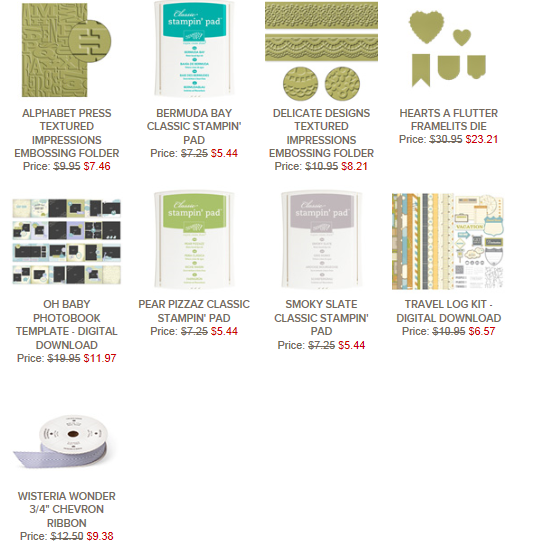 I am approaching my two year anniversary with Stampin' Up! and so thrilled to share my crafting passion with others, meet new people and get first chance at all the new products & great benefits! You too can be part of all of this! Plus with this extra bonus on your starter kit and the extra discount mentioned below, this is perfect time for your Holiday needs & shopping! 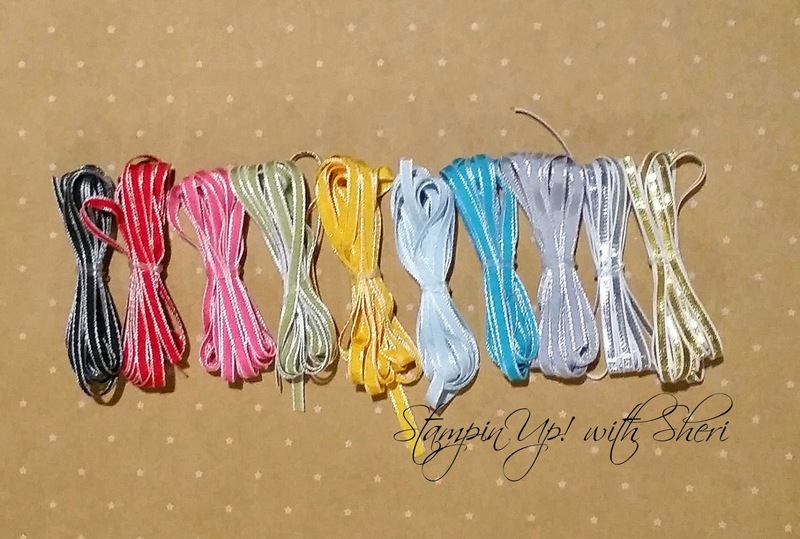 Joining Stampin’ Up! is easy and rewarding. 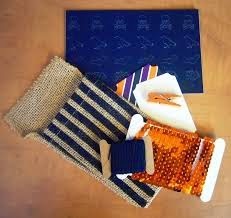 Get started today and get your personalized Starter Kit with products that suit your interests and style! 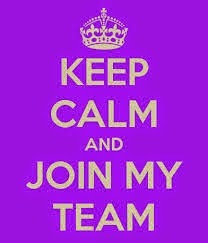 Please let me know if you have any questions or would like help joining my team! Receive an extra 10 percent discount on your first order of $200 or more when you place your order in the first 45 days of being a demonstrator. 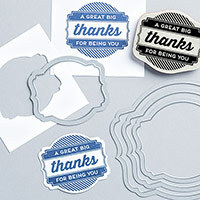 That means you’ll earn 30 percent back on your first order of quality Stampin’ Up! products! Earn free stamps and other products and cash bonuses through your efforts during your first six months. Don't forget this offer does not start until August 21, and only for one week, but wanted to let you know so you can start preparing your wishlist! 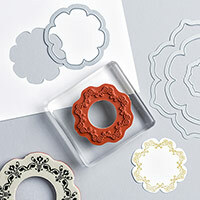 If you haven't tried Paper Pumpkin, now is a great time to sign up--get 50% off your first two months. With a deal like this, you'll want to invite everyone you know to give it a try too! 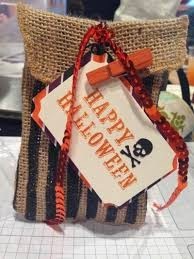 My spouse receives Paper Pumpkin every month and he loves the excitement...and then he shares it with me! I think he just loves receiving a parcel from Stampin' Up! regularly too! 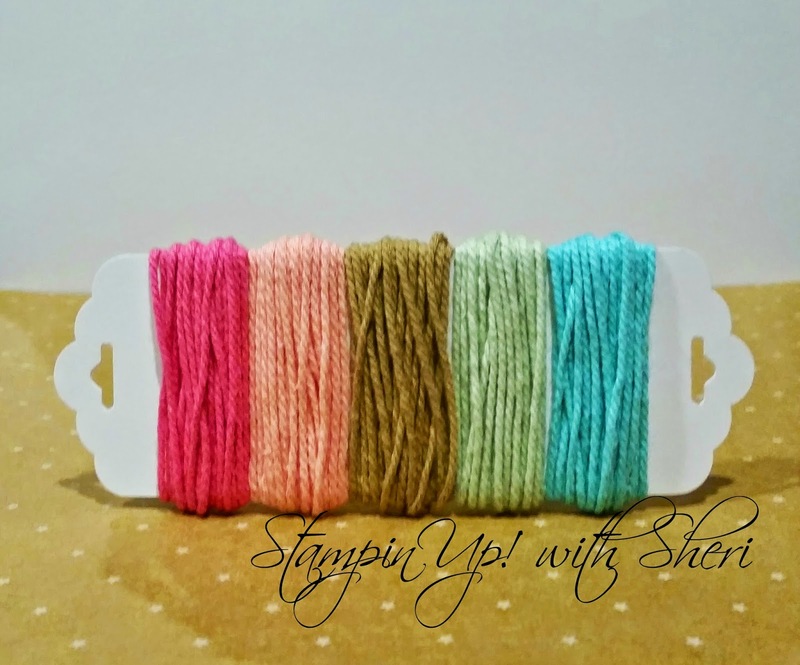 It is a great kit to craft yourself, or give as a gift (as my spouse does monthly to me)! This offer runs until September 10, 2014. 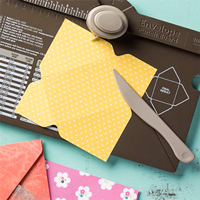 Sign up here, and use the code HALFOFF2 to join Paper Pumpkin before September 10, 2014 to get 50% off the first two months! 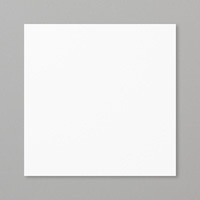 After that, keep the creativity coming for only $24.95 + tax per month (shipping included). It can be cancelled at anytime, so this is a great time to sign up and try two months for the price of one!! 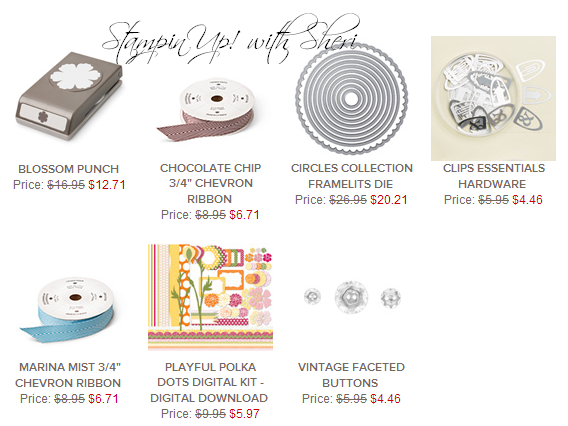 Just received an email from Stampin' Up! and it included pictures from Awards Night. This picture made my day as what a special night! I also received more information about my Rising Star event and the specialized training that I will partake in....so exciting! A handful more goodies added to the clearance rack...available while supplies last! Shop the clearance rack now! Yee-Haw! 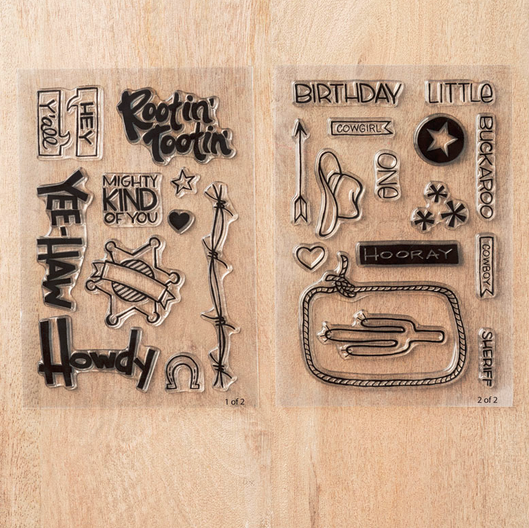 Dust off those boots, shine up your spurs, and figure out where you left your ten-gallon hat because with the 25-piece Yee-Haw photopolymer stamp set you can really let your cowboy (or girl) flag fly! Available now...shop by clicking on link below. 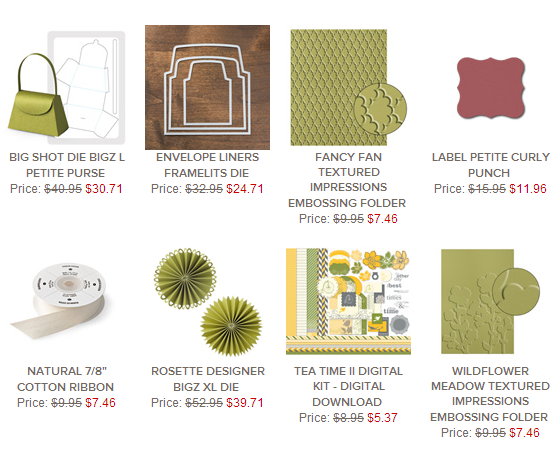 This week's deals are here! Shop now! 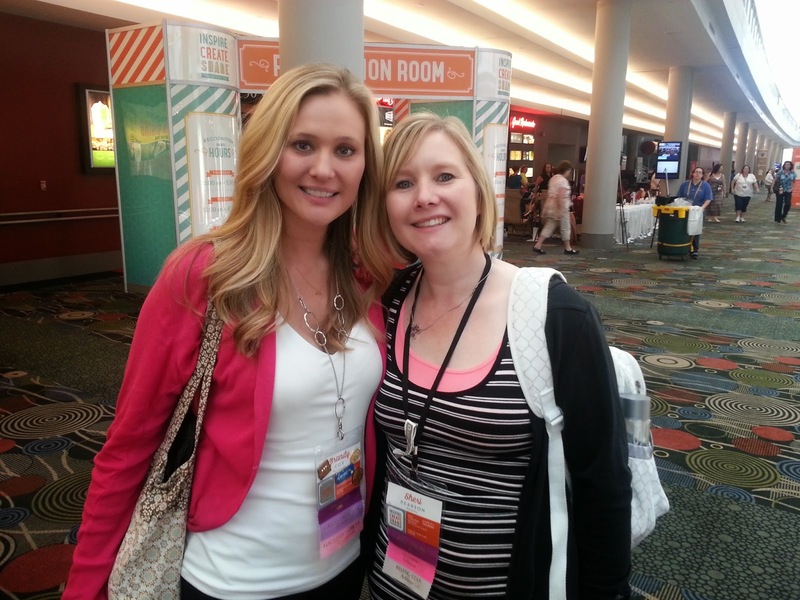 Day 3 of convention continued to be filled with fun ideas, new products and excitement! 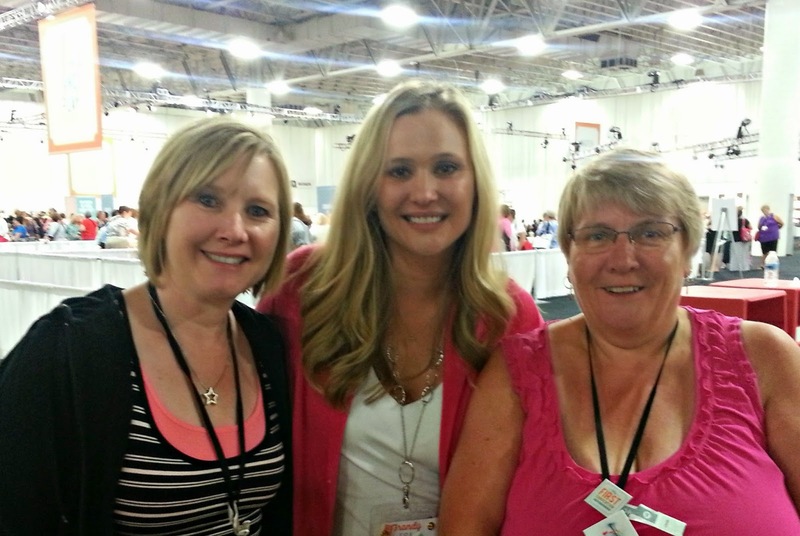 My greatest highlight was meeting my paper crafting hero Brandy Cox of Brandy's Cards. It was like meeting someone famous for me, as I have watched many of her crafting videos and she has been supporting via email for the past few months on my journey towards my "famous" moment of earning Rising Star. She is a wonderful person and I look forward to seeing her again! The rest of the day was filled with classes, swaps and then the final General Session to wrap things up. We went for a great dinner and shopping and day 4 was travelling home! Convention is an incredible experience! Join my team to attend more of these fun events! Coming up soon a local event in Nanaimo! 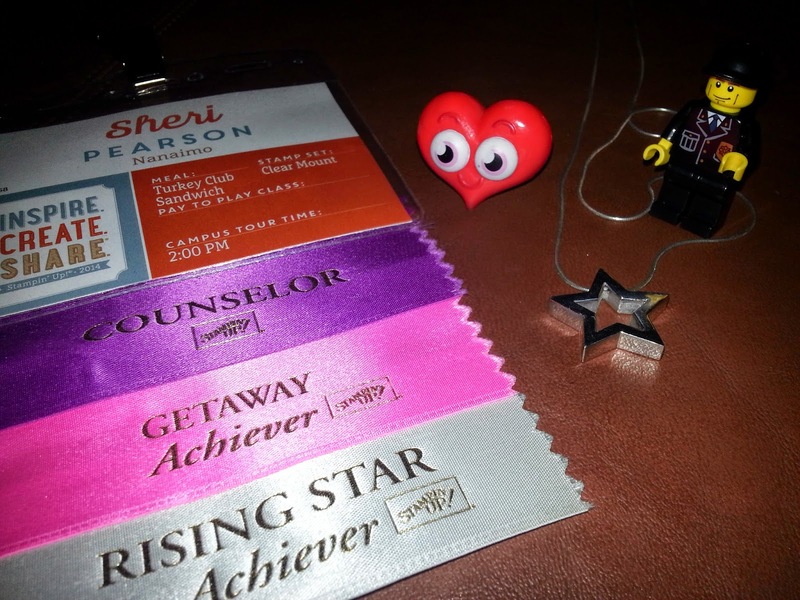 My name badge, ribbons & the Rising Star necklace I received, along with my little travel companions that the kids had sent with me. Filling product shares and I love how they look! You haven't missed out! If you would like to purchase any of the shares, just contact me! 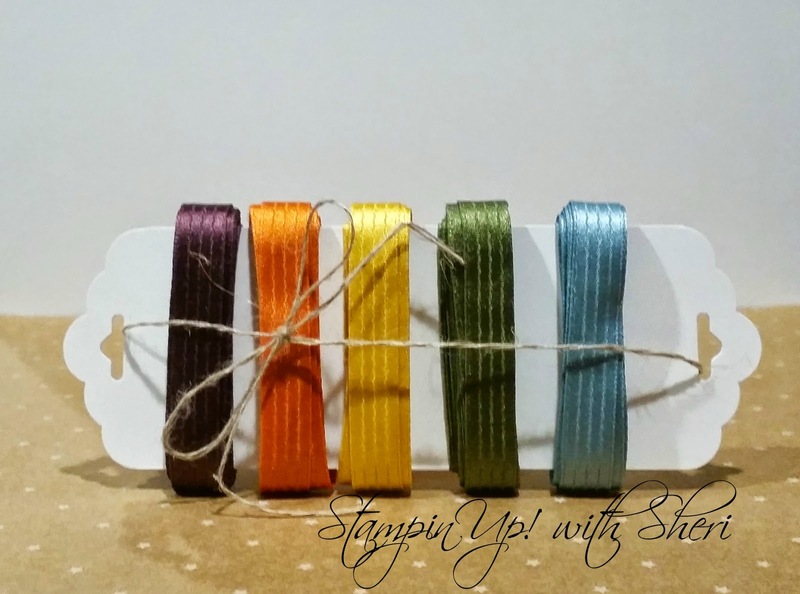 Currently working on 1/4" Cotton Ribbon Share $21.45, 1/2" Seam Binding Ribbon Share #1 $14.05 and posting the new Chevron Ribbon Share! Sign up now! 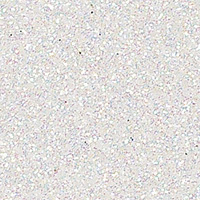 Tuesday weekly deals are here, with 9 great items on sale this week! If you've been waiting for the right time to purchase a Big Shot, that time is August! 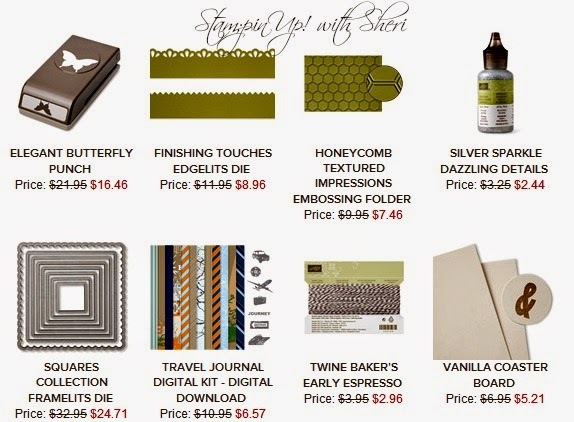 When you buy a Big Shot during the month of August, you'll receive your choice of one of five FREE exclusive stamp set and Framelits bundles --that's up to a $75 value absolutely free! If you already own a Big Shot, we're also offering a 15-percent discount on these select bundles.